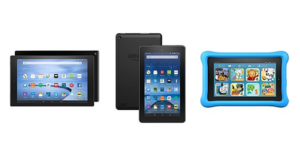 I’ve written before about how much I like my Amazon Fire tablets and how to choose which one might be right for you. In this post, I’m sharing an update, a tip, and a deal for those who already own a Fire tablet and those who are considering getting one. Apparently this actually happened about 6 months ago, but I’ve just discovered it myself. Previously, only generation 5 and 6 tablets had the most recent operating system, but in November 2016 Amazon rolled it out to 4th generation tablets, which include the HD 6, HD 7, and HDX 8.9 models. The biggest benefits of the updated software are that these tablets now work with Alexa, Amazon’s voice-activated assistant, and you can install the Google Play Store on them, giving you access to the larger library of Android apps. My go-to tablet is the 6th generation Fire HD 8, but earlier this year for some reason it kept disconnecting from my Wi-Fi network. On the tablet’s Wireless settings page, the connection would say “saved” instead of “connected.” And after I would reconnect it, it would disconnect within a few seconds. Talk about frustrating! I contacted Amazon Support and after a couple of attempts at simple fixes, they suggested I reset my tablet to factory settings. I really didn’t want to do this because I have a TON of apps, but eventually I reached the point that I was willing to take on that inconvenience to solve the problem. And it worked… for a little while. But after a couple of weeks, it started happening again. I’m not sure which models are affected by this issue and which solutions might work for each, but if it’s happening to you and the WPS option doesn’t solve it, check out this thread and see if any of the other suggestions work for you. If you’ve been looking at the current base model of the Fire tablet but thought that 8GB just wasn’t enough memory, there’s good news. Right now you can get the 16GB version for just $10 more (usually it’s $20 more). I have no idea how long this promotion will last, so if it’s something you’re interested in, you should check it out now!